The alarm feature allows you to set a time in the future for the devices to automatically turn on. Please be aware of any time zone difference when setting alarm. See guide Travelling to a Different Time Zone for more information. Only one alarm can be set on a device at any time. Enter the OpenField Console and select the 'Device Manager' tile. 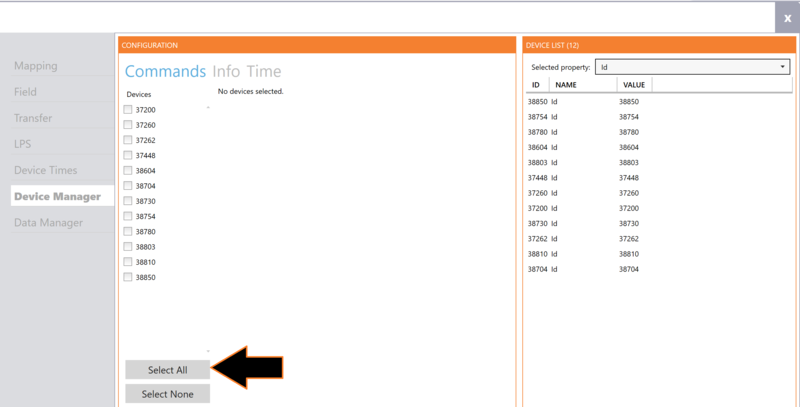 Select the devices which you wish to edit by clicking the box next to the Device ID. A selected device will have a check mark in the box. Once desired devices are selected, click ‘Execute’ Set alarm. If alarms are already assigned to devices these will display in the ‘Device List’ box on the right of the screen. In the pop-up menu set the date and time for the devices to turn on and record, ensure the time zone is correct and select ‘OK’. Verify the number of alarms and alarm time displayed in ‘Device List’ by clicking ‘OK’ in the pop-up box. Devices may now be removed. They will turn on automatically at the set alarm time. Each device only holds one alarm at a time. New alarm times set will overwrite previously existing alarm times. Time must be entered as military/24 hr time (eg. 3:00pm = 15:00.00). Alarms will only turn on if a device is disconnected from a power source at alarm time.